How do you know which leads will become customers? How do you know which leads will become your best customers? A True Fan is defined as someone who will purchase anything and everything you produce. They will drive 200 miles to see you sing. They will buy the super deluxe re-issued hi-res box set of your stuff even though they have the low-res version. They have a Google Alert set for your name. They bookmark the eBay page where your out-of-print editions show up. They come to your openings. They have you sign their copies. They buy the t-shirt, and the mug, and the hat. They can’t wait till you issue your next work. They are true fans. Kelly continues his thesis: you don’t need to become famous. If you can get just 1,000 people to spend $100 dollars a year, you can earn a very reasonable living. Sound a little over the top? It may be, and the idea sparked some backlash about its feasibility. But it also captured the imagination of artists and entrepreneurs, so much so that Tim Ferriss asked Kelly to update his original essay for the 2016 book Tools of Titans. The idea of 1,000 True Fans has taken the internet by storm. Some people will read this and immediately understand. Others will read it and start waffling over the meaning of “true.” My expansion: you need to alter what you do and how you do it so that 1000 true fans is sufficient to make you very happy. Tim Ferriss loved the idea so much that he included an updated of the version of the essay in his wildly popular Tools of Titans. Ramit Sethi of IWT and GrowthLab shares real numbers, showing that his top 1,000 customers are more engaged and bring in vastly more business than everyone else. Popular tech blogger Ben Thompson cites 1,000 True Fans as the inspiration for the membership program of his website—which costs exactly $100 per year. Across industries and business models, people have learned that top customers are incredibly valuable to a business. For phone apps, AdWeek has reported that whales account for 70% of in-app purchases—even though they are only 5% of users. In an interview, Drew Sanocki, CMO of the ecommerce business Karmaloop, argued that repeat customers were the most important driver of Karmaloops turnaround from near-bankruptcy. He also argued that alienating top customers, or “whales,” was a major cause of Karmaloop’s trouble in the first place. In the end, Drew was forced to hunt down an entirely new group of True Fans—because the previous group was so wounded. The takeaway? True Fans are enormously valuable to a business. Having them can help you thrive—and upsetting them might make you suffer. Of course, Kevin Kelly’s initial True Fans argument was directed at artists and other creators. In creative fields, the idea has come to life through crowdfunding—as the internet lets creators connect with their fans directly. 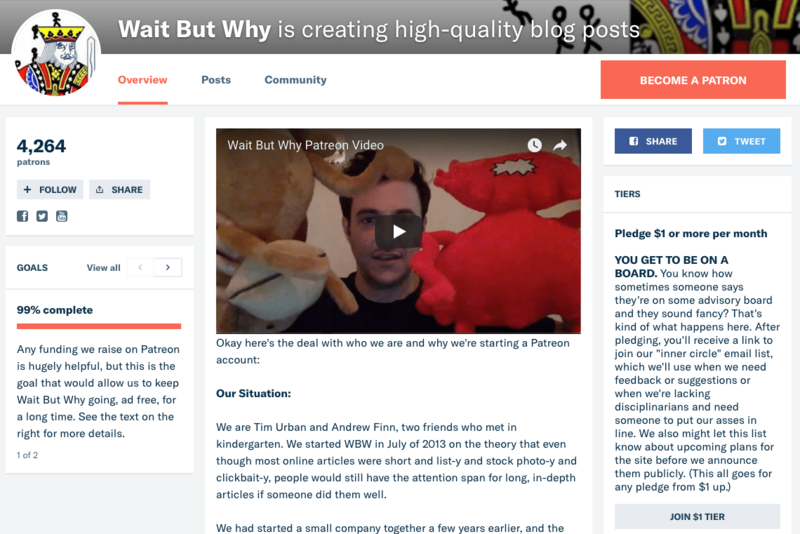 Since the original essay in 2008, the crowdfunding platform Patreon has become the embodiment of “True Fans” for creators—and Kelly even included mention of it in his 2016 update. As a platform, Patreon lets artists, musicians, and other content creators to raise funds specifically from their fans. Because the platform lets people support work that they love, it gives creators the financial means to create work that otherwise would be hard to make a living from. It also incentivizes creators to do more for their top fans—getting larger amounts of donations and keeping “patrons” around is a crucial part of raising money on Patreon. 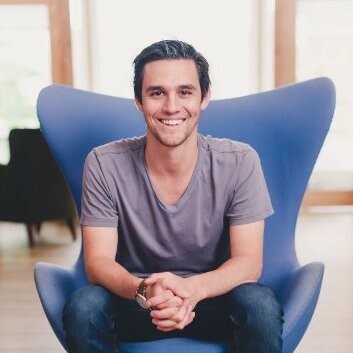 Tim Urban runs the well-known blog “Wait But Why.” Even though blogs can be hard to make money from, he brings in $12,000/month via Patreon—and the site is so popular that Urban was offered the chance to do a rare in-depth interview with Elon Musk. Kina Grannis launched her music career when she won the 2008 Doritos Crash the Super Bowl contest. Alongside her victory came a deal with Interscope records—but Grannis quickly discovered that she didn’t care to be tied to a record label. With over 2000 supporters on Patreon, Grannis is able to be a full-time independent artist. YouTuber “TierZoo” has recently burst onto the scene, creating zoology videos that analyze animals as though they were video game characters. TierZoo used Reddit to hit over 15,000,000 views across all videos. By using Patreon to get donations directly from fans, TierZoo was able to transition to making videos full-time. The ability to get paid by your fans and best customers is important—and the ability identify and cater to those fans is a huge part of growing your business. But how can you get 1,000 True Fans? Is the theory really all it’s chalked up to be? The 1,000 True Fans idea has sparked as many critics as it has fanatics. 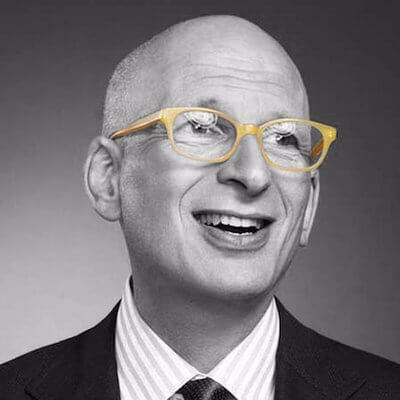 Although, as Seth Godin wrote, some people “immediately understand” the value of the idea, there are also a lot of entirely valid criticisms. The most important? A “True Fan” isn’t so easy to come by. Let’s take another look at the definition of a True Fan. They will drive 200 miles to see you sing. They will buy the super deluxe re-issued hi-res box set of your stuff even though they have the low-res version. They have a Google Alert set for your name. They bookmark the eBay page where your out-of-print editions show up. They come to your openings. They have you sign their copies. They buy the t-shirt, and the mug, and the hat. They can’t wait till you issue your next work. They are true fans. It’s a pretty demanding definition. I have many artists, creators, and products that I love—but just loving the product isn’t enough to become a “True Fan.” I’ve never followed someone on tour, I don’t really buy merch, and my interest (though strong) fluctuates over time. In any given group of people, what percentage do you think are True Fans? It’s got to be pretty small. This is far and away the most common criticism of the 1000 True Fans idea. In theory, a creator could survive off “only” 1,000 dedicated people. But in practice, finding 1,000 people dedicated enough to support you means reaching a much, much larger total audience. The idea of 1000 True Fans is that you don’t necessarily need to be famous to be successful. But in order to get to 1000 fans, you do need to become a little famous. Science fiction author John Scalzi added to this argument in a very cogent response to Kelly’s original essay. As I mentioned, I’ve never followed someone on tour and I don’t buy merch. I’ll see an artist if they come to my city, and I support two creators with small donations on Patreon. But that’s about it. Most people are like me. People might spend a bit to support stuff they like, but not everyone will and not everyone will spend a lot. A final criticism of 1000 True Fans comes from Robert Rich, in another response to Kelly’s original essay. “A further caveat: it’s easy to get trapped into the expectations of these True Fans, and with such a tenuous income stream, an artist risks poverty by pushing too far beyond the boundaries of style or preconceptions. I suppose I have a bit of a reputation for being one of those divergent – perhaps unpredictable – artists, and from that perspective I see a bit of a Catch 22 between ignoring those expectations or pandering to them. If we play to the same 1000 people, and keep doing the same basic thing, eventually the Fans become sated and don’t feel a need to purchase this year’s model, when it’s almost identical to last year’s but in a slightly different shade of black. Rich’s argument clearly applies to artists and creators—when you rely on True Fans, you need to keep pleasing those True Fans even if your creative ambitions lie elsewhere. But the same principle can apply to other business. Karmaloop alienated its “whales,” or True Fans,” and nearly went bankrupt. Recovering from their mistakes meant building an entirely new group of True Fans—the ones they had lost were never coming back. When I worked at an agency, we had a $1.5 million project that accounted for a huge percentage of our revenue. If that client wanted something, they got it—but repeatedly giving in to a client’s changing demands didn’t produce the best work or the best results. These criticisms of the practical use of 1,000 True Fans are very real and very challenging. I would also argue—they can be overcome. And even if you don’t literally focus on having exactly 1,000 True Fans, the principle of focusing on your best, most loyal customers can have a powerful effect on your business. Step 1: Put your email below. Step 2: Get our best marketing advice once each week (and find your fans). In recent years, Apple has been criticized for losing its innovation. As the argument goes, the days of revolutionizing industries are over for Apple. They aren’t going to revolutionize music the way they did with the iPod and iTunes. Or change phones and computing forever with the iPhone. Or change computing again with the iPad. Add in Apple’s famous “closed network,” and the fact that you need a dongle to use Apple devices with devices from any other company, and you can see why a lot of people are upset with Apple. Ben Thompson isn’t one of them. In a piece titled Apple’s Middle Age, Thompson argues that Apple is actually pursuing the exactly correct strategy. No longer in its swashbuckling, tumultuous early days, Apple doesn’t need to continuously innovate in the same way that they used to. There’s more value for Apple in providing value to their existing users. 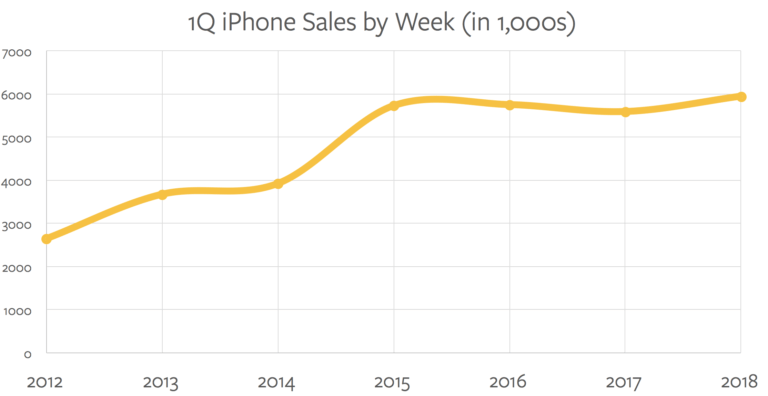 iPhone sales have started to plateau. So Apple needs another strategy. In other words, Apple is focused on making more products for their existing customers. Apple Music, HomePod, AirPods, Apple TV, and Apple Watches are all designed to sell more to current users. Here we have a lesson that can be applied to many types of companies (not just artists, and not just Apple). You can engineer your business to appeal to True Fans by focusing on repeat business—because the people most likely to buy from you are already pleased customers. Focusing on serving True Fans doesn’t mean that True Fans need to be your only customer. It means that you need to deliver an incredible experience for your existing customers and create opportunities for repeat business. Ramit Sethi’s products aren’t cheap, but they aren’t $8,000. His top 1,000 customers are buying multiple products. Apple has a similar approach, and if you’ve seen the ads for a million different Alexa-enabled devices, it looks like Amazon is trying a similar approach. If you want to be able to keep generating revenue from your existing customers (and don’t run a subscription business) you need to have things to sell them. Amazon is creating Alexa-enabled products that integrate into basically every part of your life—playing music, watching TV, turning on the lights, checking who’s at the door, and making phone calls. If you’ve bought a bunch of Alexa products and set them up around your house, are you really going to switch over to Google Home? By serving True Fans, Amazon creates an opportunity to sell more devices to the same customers—and makes it less likely that those customers will switch to a competitor. What if you aren’t Amazon? What if you don’t have the resources of Apple? How can you create your own True Fans? You don’t have the massive resources of a company like Apple, but there are still things you can do to deliver more value to your current customers—and get more value in return. A lot of smaller businesses let a valuable resource go to waste. Even if you don’t have “True Fans” that buy literally everything you create, there are lessons to be learned from the idea of True Fans. 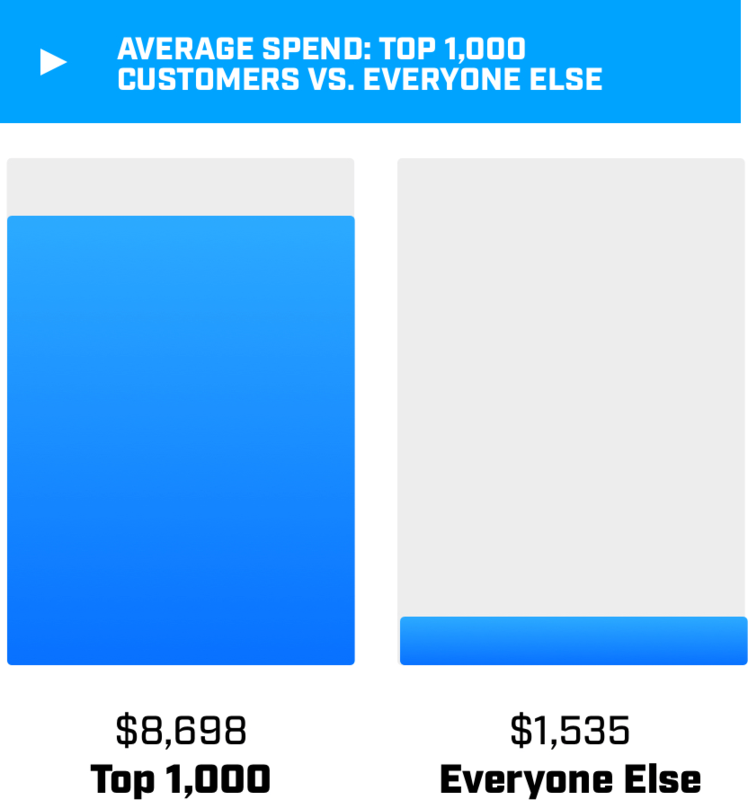 The people most likely to buy from you are the people who have already bought from you. If you don’t target and keep selling to those people, you’re neglecting a huge opportunity for your business. Luckily, once you realize this, it isn’t all that hard to sell to your existing customers. Here are five ways you can use the idea of True Fans in your business. Your True Fans aren’t the same as everyone else. So don’t treat them the same. When you can identify a group of people that are more likely to buy from you (usually your existing customers), you can keep them around by offering exclusive value. Stuff you don’t pass out to just anyone. Ramit Sethi did this recently during a launch for one of his new courses. 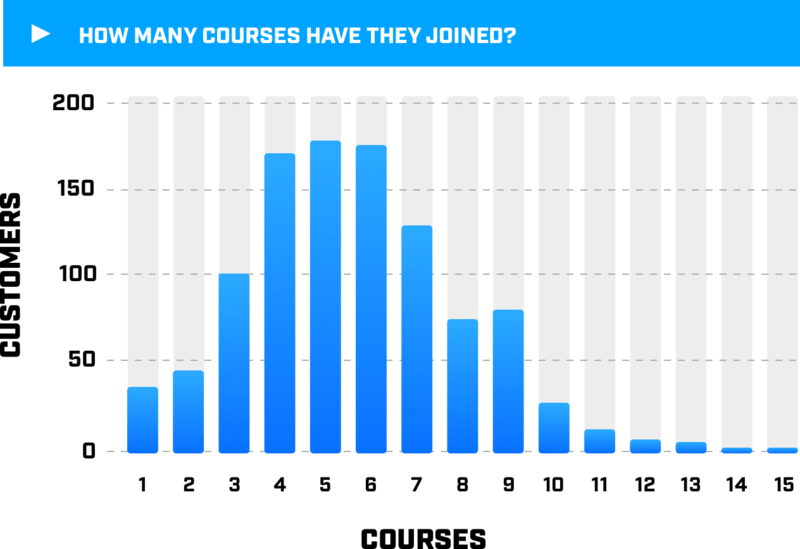 The course, titled Behind the Sales Email, was targeted at online course creators who wanted to more effectively sell their courses through emails. 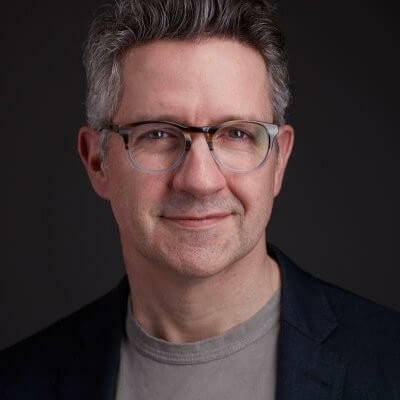 Of course he put his email list through a standard email funnel—but he also put together some additional content just for existing customers. The content was brief. It was a “behind the scenes” of Behind the Sales Email, showing the thought process that went into each email of the main sales sequence. The content itself? 1-minute long videos, delivered daily, of Ramit speaking into his smartphone. Exclusive content doesn’t always need to be a massive undertaking. You can bring people behind the scenes or, as Grannis does, host private online meetups and hangouts. These tactics show your most loyal customers that you care about them. People like to feel like they’re getting something exclusive. They also showcase your personality (more on that later). You can’t get more from your existing customers if you have nothing else to sell them. At the same time, you don’t necessarily want to just “sell more products.” Adding products or services to your business takes work, so you want to make sure you offer the type of product that goes well with what you’re already good at. For a cool example of this, check out Dollar Shave Club. Dollar Shave Club got popular because they provide high quality razors, delivered to your door at for bargain prices. 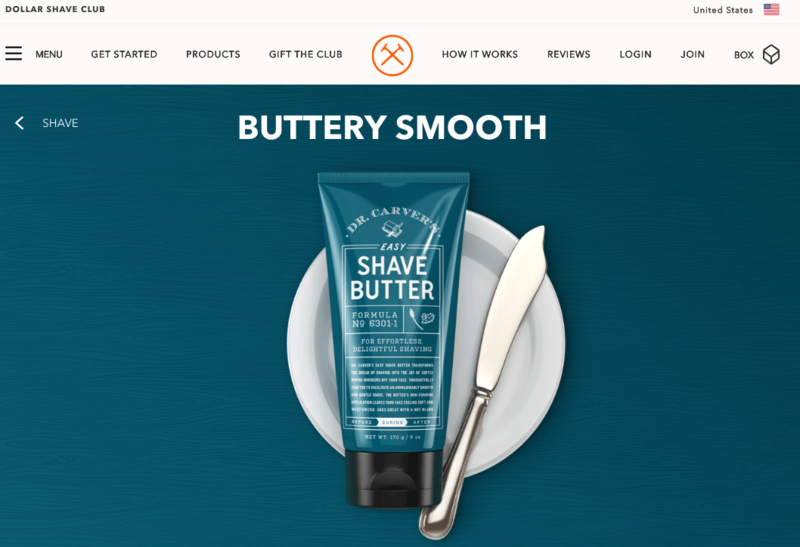 That simple value proposition helped Dollar Shave Club start growing. But once they had a customer base consistently buying razors, they needed to find a way to keep generating revenue. What did they come up with? Just look at their website. Shaving cream. Aftershave. Shave butter. Shampoo. Toothpaste. Toothbrushes. Hair products. Skin care. Dollar Shave Club had access to an audience interested in a high-quality shave…so they offer other products to create a generally high quality bathroom experience. What do your customers buy? What does that say about them? What else might that kind of person want? In a Facebook Live AMA about ecommerce marketing, our very own Jordan Skole shared how he thinks about targeted sales in his online store. Offer a complementary product: What goes well with the main thing you sell? Sell that. Offer add-ons to your top product: Accessories and add-ons are a simple way to keep selling. Add a service to a product: A course about online business can come with coaching. A piece of technology can come with training. Add a product to a service: A massage therapist might sell massage oil to clients. A dentist can sell toothbrushes. If you’re going to identify True Fans, you need to have multiple things for them to buy. In his AMA about ecommerce marketing, Jordan shared another crucial point that applies to True Fans. “As marketers we talk a lot about customer acquisition cost. But it’s a lot cheaper to get people to make the second purchase than it is to get people to purchase the first time. Getting a customer is much, much harder than keeping a customer. So it makes sense to do everything you can to please your current customers—and intervene if it seems like they’re going to leave. You can even automate this kind of follow-up. Here are a few of the types of winback/loyalty campaigns you might consider trying. Reward people who buy a lot: Once a customer has spent a certain amount of money with you, trigger an automation. Send them messages with exclusive offers as a reward. Remind people who haven’t bought in a while: Has a top customer been quiet for a few months? Trigger an automation that activates when a customer hasn’t made a purchase for a while…then follow up and offer them a deal. Time your follow-up to their need: How long does it take to use a bottle of shampoo? Or to explore the features of a new computer? You can anticipate when your customer is going to need more shampoo or have laptop questions—so you can use an automation to follow up at that exact time. 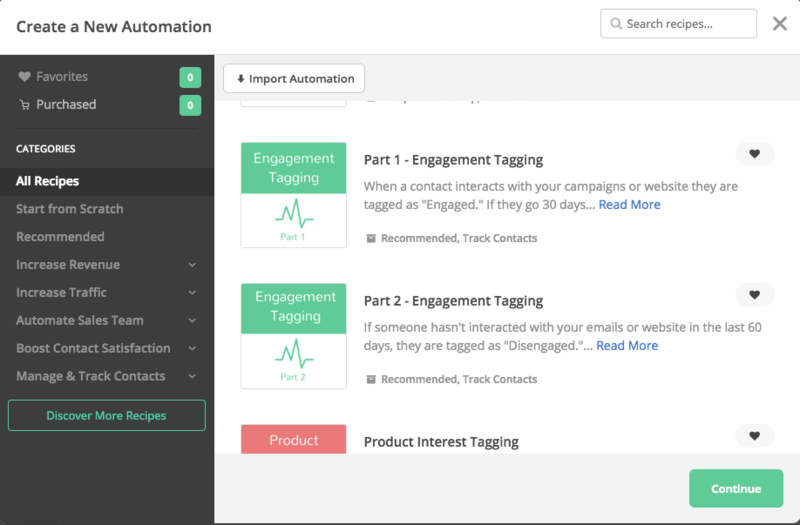 In ActiveCampaign, we even put together a simple, pre-built automation that tells you when people become disengaged—when they haven’t interacted with you in a while. When someone becomes disengaged, you can instantly trigger an automation to re-engage them. (By the way, you can do all those other automations in ActiveCampaign too). Your existing customers are probably also your best customers. Do what it takes to keep them around. Customers leave companies for a lot of reasons. They outgrow your product. They found a cheaper competitor. They don’t like your service. If you compete only on price or benefits, you run the risk of losing customers when a competitor comes along. But that isn’t true if you compete on personality. Your personality is a competitive advantage. No one can copy your personality, and a strong personality can help you attract and keep customers. An independent musician like Kina Grannis doesn’t have the marketing force of a record label behind her. But she does have a loyal fanbase—built in part because each of her videos end with her directly talking to her followers. Ramit Sethi has some of the best email marketing around—because people want to open his emails. The content is funny. It’s entertaining. It’s as interesting and personality-filled as it is useful. A lot of entrepreneurs and small business marketers are worried about putting too much of themselves into their marketing. And I see the fear—you want to seem professional, and sometimes that means not talking about a funny thing your cat did. Still…anything you can do to let your personality shine through will help you build True Fans. Customers will buy from you because what you offer is useful. True Fans buy from you because they like you and what you stand for. So…should you go for True Fans? If you take the idea of 1,000 True Fans literally, it’s easy to find flaws. Finding 1,000 True Fans isn’t easy. Relying on a small base of support can be dangerous. Each fan needs to spend a good chunk of change (because you don’t necessarily get $1 for every $1 they spend). As a concept, though, the idea of True Fans is extremely valuable. 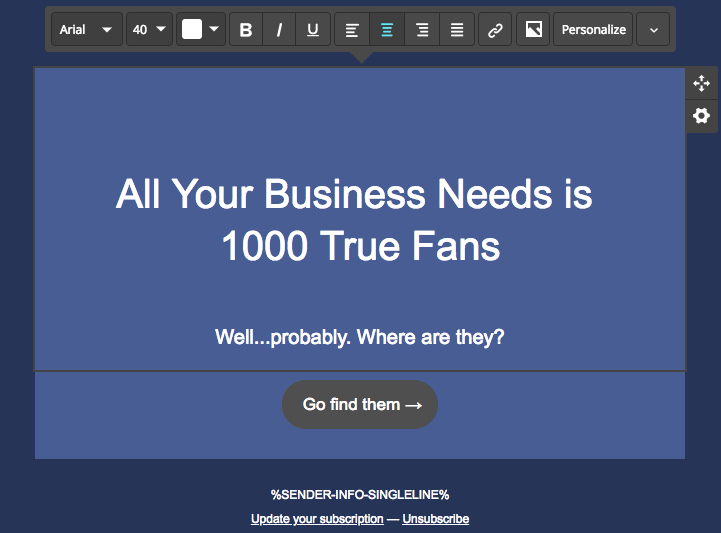 Set aside the specific number of fans, or even the idea that your fans need to be foaming at the mouth for your brand. Then ask yourself: what else can I offer my existing customers?